This is the last recipe showcased under the theme 'Prep to plate in 30 minutes'. This is a family favorite and is easy to make on short notice. This sabji goes well both with rice and roti. Over the summer, a group of friends went on a camping trip armed with Instant Pot and an electric griddle. One of my friends made a similar Aloo tamatar ki sabji in the IP and we all had a wonderful meal both with rice and store bought rotis. That definitely inspired me to tweak the recipe and make this my own. Switch on the power for the IP with the inner pot placed. Set it to 'Saute' mode. When the display shows 'Hot', add oil and the seasoning. After the mustard seeds pop, add cumin seeds and ginger. Saute for a few seconds. Add in the chopped tomatoes, the tomato mixture set aside and mix well. Add in the Salt, Turmeric, Dhania Powder, Jeera Powder, Garam Masala, Chaat Masala, Red Chili Powder as needed. Add the cubed potatoes and about a cup of water. Put the lid. Cancel the Saute mode. Set the mode to 'Manual' or 'Pressure Cook' [depending on the IP model]. Set it for 4 minutes. After it is done, let the pressure release naturally. After the pressure is released (I have tried QR after 5 minutes as well), open the lid, sprinkle kasuri methi and mix well. Remove from the IP. Serve with Rice or Roti. Check out the Blogging Marathon page for the other Blogging Marathoners doing this BM#94. These noodles are comfort food for my kids and my older one makes them all the time. She cooks as a way to relieve stress and these noodles are relatively easy and quick to make. She makes about 3-4 servings, shares them with her sister, and packs away the rest for their lunch boxes for the next working day. I was surprised the other day when she made these in the middle of the night and left a note for me that I needn't worry about their lunch boxes the next morning. Would I be a bad mom to feel relieved? I honestly don't think so :). If I were to make these noodles, I would definitely add grilled tofu to the side and some salad too. * I use spaghetti most of the times. Boil the noodles/spaghetti al dente as per the instructions on the package. Reserve 1/2 cup of the pasta water and set aside. In a mixing bowl, add all the ingredients listed under the 'For the Sauce' and whisk until the brown sugar is dissolved. In a heated wok, add oil and grated garlic. Saute until golden brown. Add in the onions and saute until translucent. Toss in the cabbage and carrots, stir fry for a few minutes making sure the vegetables retain a crunch. Pour the prepared sauce, mix well and toss in the drained noodles/spaghetti. Toss all of them so the sauce is absorbed well by all the spaghetti/noodle strands. This week I shall showcase some meal ideas which takes about 30 minutes from preparation to the plate. When I first came across this version of Nawabi Dal a few years back, I could not believe or digest the addition of milk in the dal. But over the years I have learnt to disregard some of my fears and biases and in the recent months I have started making this dal at least once a week as it has become one of the favorite dals at home. I typically cook dal and rice at the same time in the Instant Pot (in the pot-in-pot method) which takes around 25 minutes from start to finish. Meanwhile I make rotis for the adults. The rotis are ready by the time the pressure has dropped from the Instant Pot. I prepare the seasoning on the stove top and by the time the table is set everything is ready. The idea is to keep the consistency of the dal slightly runny and I love to slurp it as a soup. My kids love it with Rice whereas I prefer either the soup version of with roti. This dal thickens a little as it cools down. Wash and pressure cook toor dal with 3-4 cups of water along with salt, turmeric and green chilies. After the pressure is released, prepare the seasoning. In a heated pan, add oil and the rest of the seasoning. After the cumin seeds splutter and the garlic is golden brown, add the cooked toor dal mixture and adjust the consistency by adding water. Let the dal come to a rolling boil. Boil milk separately and add the hot milk to the simmering dal. Sprinkle the chopped coriander leaves and remove from heat. Serve with rice or roti. For the last day of this series of 'Sweets without refined ingredients', I showcase the classic recipe of Maramarala Laddu or Borugula Unta with a change in shape. My childhood fear has always been to eat a giant sized maramarala laddu. I never could properly take a bite of the huge laddu. To this day that fear remains at the back of my mind and hence I never thought of making this laddu at home. It so happened that my husband casually mentioned his childhood memories regarding these laddus and I warned him ahead of time about my fears and he accepted the smaller sized laddus :). 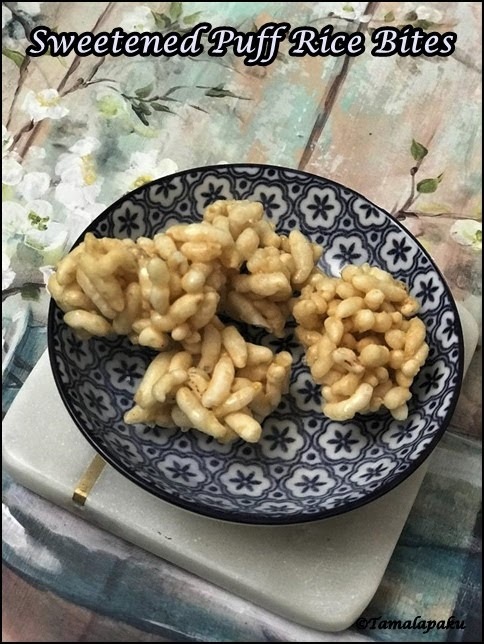 In a heated pan, dry roast the puffed rice for a couple minutes and remove onto a wide plate. In a heated wide pan, add jaggery and water. Let the jaggery melt. Strain the syrup to remove any impurities. In a clean pan, add ghee and the jaggery syrup and let it simmer until the syrup is frothing up. After about a couple of minutes, pour a couple drops of the simmering syrup into a bowl of water. If the syrup forms a tight ball, the syrup is of the right consistency. Reduce the heat, put in all the roasted puff rice. Mix well and remove from heat. The whole mixture should still be a little moist. Transfer into a wide plate. With slightly moist hands, pinch portions of the mixture and make laddus or any shapes. I wanted a smaller sized laddu so I was unable to get a proper shape. Serve immediately or store them in an air tight container. For the second day of sweets without refined ingredients, I have here some healthy bites made with pumpkin, almonds, dates and coconut. These bites made a delightful snack and a treat for friends on the eve of Diwali. Keep in mind that these were very addictive and they were made on a cold day and might have survived for a couple days more in the wintry climate we are experiencing right now. Boil the pumpkin cubes and mash them (or 1/4 cup of store bought pumpkin puree can also be used). In a chopper, coarsely grind almonds and set aside. Make a coarse paste of the dates . Combine the pumpkin puree, coarsely crushed almonds, coarsely ground dates and coconut powder. Min well and pinch bite sized portions of the mixture and roll into any shape desired. Roll these bites in dry coconut powder and arrange them on a platter. Serve immediately. These bites stayed fresh for 2 days on the countertop. This week I have chosen to highlight some sweets without any refined ingredients. Here the sweetener used is Jaggery. I have tried it a couple of times so far and each time it came out the same. I added milk the first time and half n half milk the second time. The difference wasn't as noticeable. This is a perfect sweet pongal to offer to the Lord as well. In a pressure cooker, wash foxtail millet and chana dal. Add 2 1/2 cups of water and cook for 15 minutes or up to 2 hisses. Meanwhile, heat jaggery in a tablespoon of water until it melts. Strain the melted jaggery and remove any impurities. After the millet-chana dal mixture is cooked well, transfer into a pan with the melted jaggery. Sprinkle the coarsely crushed nuts and cardamom powder. Cook well until the jaggery syrup starts solidifying. Heat the half n half milk separately. Allow it to cool a little. Remove the pongal from heat. Add in the milk from the above step. Mix well and set aside for 5-10 minutes. Serve warm with a topping of more toasted nuts and ghee. These bite sized paniyarams are one of the best ways to sneak in millets. My family has yet to accept all forms of millets. To ease them into accepting, I found that making idlis, dosas and paniyarams are the best ways. Soak foxtail millet, chana dal, toor dal, moong dal and poha for about 4-5 hours. [I soaked them overnight]. Grind them into a fine batter adding as little water as needed. Mix in salt, green chili-ginger paste and coriander leaves. In a heated pan, add oil, mustard seeds, chana dal, urad dal, cumin seeds, asafotida and chopped curry leaves. After the dals are brown and mustard seeds pop, saute the onions for couple of minutes. Add in grated carrots and saute for another minute. Remove from heat. Add this mixture to the batter. Heat the Paniyaram pan (Appe pan/Abelskiver/Ponganala Penam). Grease the slots with about 1/2 teaspoon of oil in each. Pour about a tablespoon of the batter in each of the greased slots. Cover and allow to cook for about 4-5 minutes or until the steam starts sizzling. Remove the cover, flip the paniyarams and allow them to cook for a further couple of minutes. Remove carefully using a spoon and continue with the rest of the batter. Serve warm with chutney of your choice. These days I have been substituting rice with a variety of millets. Today I have an idli with Kodo millet made with kodo millet and urad dal. The batter is easy to grind and it ferments beautifully as well. Recently I have had friends talk about using millets in their diet and my parents have already started using millets on a daily basis. The 'back to the roots' movement has caught on, so to say. So it is definitely useful to catalog all the millet recipes so we have all recipes at one place. Note - If the batter is not sufficiently fermented, add half teaspoon of ENO fruit salt to the batter just before pouring into the idli plates. Wash and soak Kodo millet and Poha for about 4 hours. Wash and soak Urad Dal and fenugreek seeds for about 4 hours. Drain and blend the kodo millet - poha mixture into a coarse batter adding as little water as needed. Drain and blend the urad dal - methi seeds mixture into a fine batter adding as little water as needed. Combine both the batters, add salt as needed and mix well. Cover and set aside in a warm place for a few hours for fermentation. After the batter is fermented, divide the batter in the Idli plates. Steam for about 15 minutes. Let it cool for 5 minutes and then remove from the moulds. Serve it with Peanut Chutney or Coconut Chutney for a filling meal. Welcome to yet another edition of BM. In the first week of this edition, I have chosen to highlight some recipes where millets can be used. Sanna Polo happens to be a Vegetable and Rice based Dosa from the Konkani cuisine. 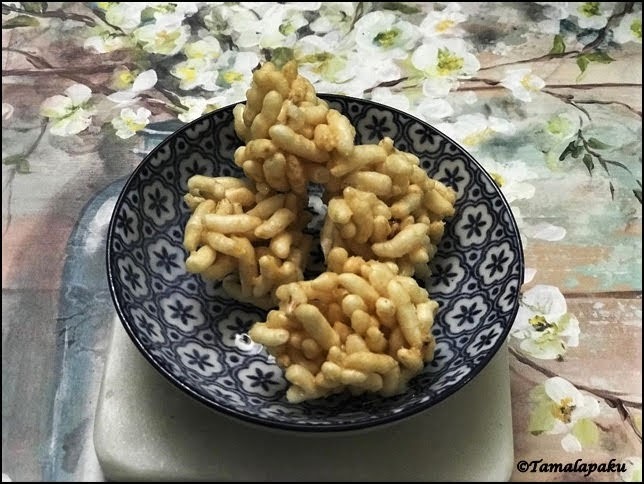 Here instead of rice, my friend and fellow blogger, Sowmya has substituted some of the rice portion with millets and I found it to be very interesting and tried it right away. In these dosas, cabbage has been used but it can be substituted with drumstick leaves, palak, or any other vegetable of your choice. The play of the spices and vegetables definitely alters the taste and can enjoy the goodness of the ingredients. I served this for breakfast and is a perfect one for a weekday breakfast. This is a no-ferment dosa. Soak rice and millets overnight. Grind them with as little water as needed adding grated coconut, red chilies, tamarind extract and salt. Into the batter, add the finely chopped cabbage, onion and coriander leaves. Adjust the consistency of the batter so it is pourable. On a heated griddle, pour a ladleful of batter and spread in a circular fashion . Drizzle oil as needed and allow it to cook. Once the underside is cooked through, flip it carefully and cook on the other side as well drizzling oil as needed. Remove on to a serving platter and continue with the rest of the batter.